You like Windows Vista gadgets, but you feel that it clutters up your desktop, leaving lesser space for your desktop icons. You like to have the sidebar always on top, but at the same time you don’t want to reduce the screen area of your applications. 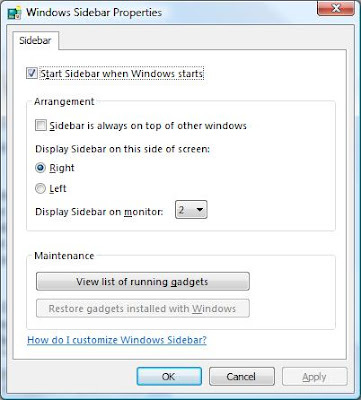 If you’re using dual monitors on Windows Vista, here’s a handy tip: You can use your secondary screen for the gadgets! Well, this leaves more room on my primary (read: more important) monitor. My applications are free to roam the entire canvas and I always get the bigger picture. On my second monitor all the gadgets, the clock, the to-do notes, and everything is within easy view at anytime. If you’re an administrator, you can use the secondary monitor for Remote Desktop connections to servers. You can even use the Remote Desktop gadget to save time. Go to Control PanelAppearance and PersonalizationPersonalization. Open Display Settings. 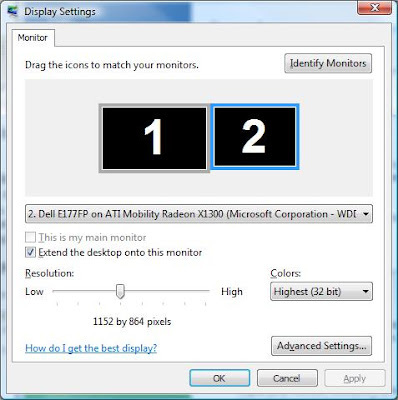 Click on your second monitor and check the box “Extend the desktop onto this monitor“. Go to Control PanelAppearance and Personalization. Open Windows Sidebar properties. Under “Display Sidebar on monitor“, choose the second monitor.